Coordinate your workforce quickly and efficiently using uTRAC’s personnel communication tools. uTRAC’s online scheduling software is enhanced through better communication between managers and their workforce. Staff and freelancers will benefit from never missing a beat about upcoming work posted to their Job Board which is accessible on any device through the uTRAC Staff Portal. Whatever the size of your organization, uTRAC allows managers to coordinate bigger and more complex teams through intelligent workforce communication. See how uTRAC can half the time it takes to book your crew. Once staff have been confirmed for shifts, they can review their work schedule on any device. Staff will automatically be notified of any shift changes while also being able to sync their schedule to their favourite calendar app. Managers can get snapshots of resource availability by posting jobs publicly to their entire workforce or to segments of their workforce. Staff will be notified of any recent posts and apply through their Job Board. Send availability requests to get final confirmation from your assigned team members before the roster is finalized. Workers may also submit time-off requests pre-event to give managers a better picture of resource availability. uTRAC is ideal for sending mass communications to your various teams. Whether through email, sms, or push notifications, uTRAC is an effective solution for managers to send manual and automatic updates to large fractured teams. Put Your Employees' and Freelancers' schedules straight in their pocket and make sure they never miss an update about upcoming work. 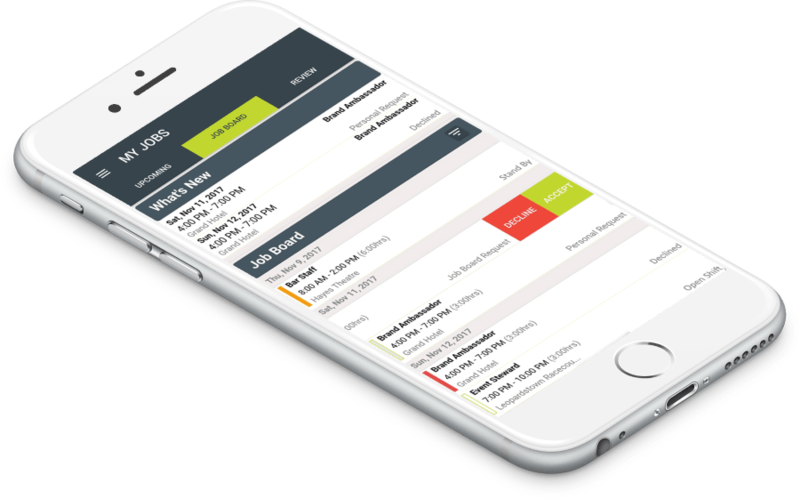 The uTRAC app is available for free on iOS and Android and allows your workers to set their availability and always stay in the loop. Everyone in the right place, at the right time. Send shift alerts directly to your staff's pockets. Staff can confirm availability to work and apply for open shifts. Staff can find shift locations in Google Maps. Staff can sync upcoming work direct to their device calendar. Staff can review previously worked shifts and upcoming pay. Staff can send time-off requests direct to managers. uTRAC is specifically designed to aid the management of flexible workforces with intuitive staff scheduling and communicaiton features that can half the time it takes to roster your teams.